My Senior Cavalier King Charles Loves it! I have an 11 year old female cavalier king charles spaniel that has had numerous dental surgeries. After this last one she did not want to eat her normal science diet perscription kibble. I tried Freshpet and she gobbles it down with no hesitation. 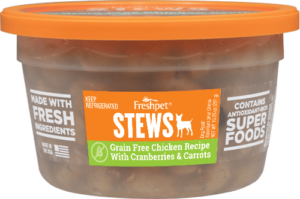 Thank you for providing a dog food that my sweet girl absolutely loves…..I love the fresh ingredients and knowing she is not getting all the fillers and junk other dog foods have.